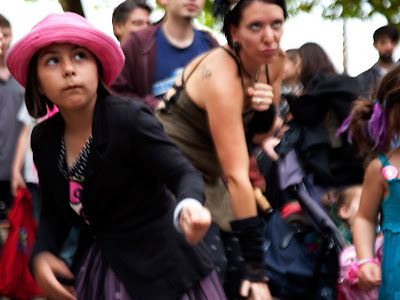 The Thames festival is on all weekend. A big party to mark the end of summer. Here everyone is doing karaoke dancing. An animated dancer shows you all the moves, while a compare encourages you to give it your all. I'm off to enjoy another full day of fun. I love the concentration on those faces! Dancing is a serious business . . .
Looks like fun Mo, I would be the one going in the opposite direction to everyone else!! What fun. Cute pic. Hope the party was good. Sounds like fun and sounds like you have even more fun in store. Hope you enjoyed the W/E also hope that it's not the complete end of summer! What a charming young girl! I love street performance. Sounds like a great time. Nice photo.